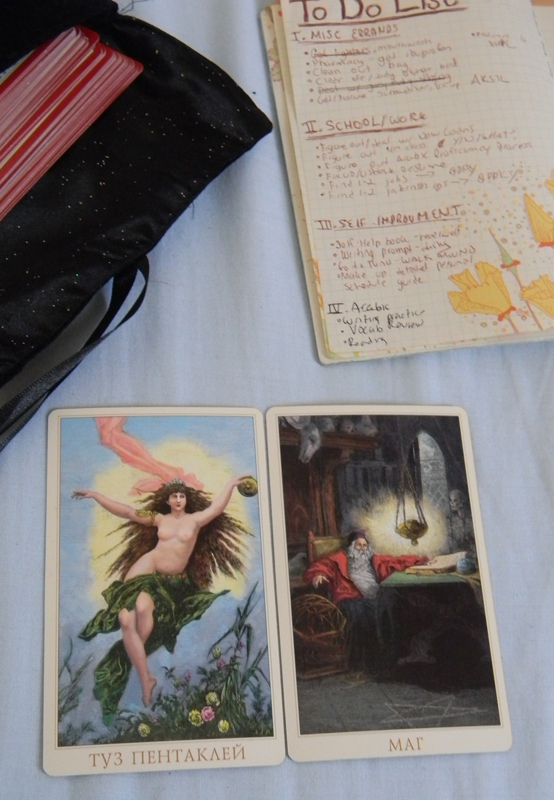 Ace of Pentacles and the Magician came up in today's draw. Interesting juxtaposition here, I think, in between the Ace, where the woman, though surrounded by nature and green and such 'earthy' symbols, is literally floating in the air, and the Magician, where the old man is rather firmly and comfortably seated in his study, surrounded by books, relics of arcane study, the like. Both of these cards talk about the mundane, material, concrete world, though they use rather different visual metaphors. Being an Ace, I see the first card as speaking of beginning, of taking some concrete action, of working on getting some momentum going. The woman has her arms open, as if ready to embrace something new. The flowers below her and the coin in her grasp suggest that the focus of this should be in the worldly rather than the intellectual realm. And indeed, I have been...largely focused on the intellectual the last few days. Reading a few biographies, getting a bit more in the groove of working with cards, studying and studying the Arabic. Which is all fine and good, of course, but I finally actually got to organizing myself properly with a To Do List (for me QUITE helpful to actually getting things done) and it made me realize just how many more concrete things, both smaller (ie. clean out my bag) and larger (ie. bank stuff, resume stuff, loan stuff) I've been avoiding or putting off doing. The Magician of course, can represent all kinds of concerns, but given the nature of the image here, and the pairing with this Ace, I see it as a reinforcement of the need to focus a bit on these things today as well. The Magician is, of course, very much too about personal will, motivation, ambition, and a reminder that as difficult or tedious as some of these tasks may seem, they are certainly within my power to get done if I put my mind to it. This is such a gorgeous deck, with so many layers! I'd never thought of how ungrounded that Ace of Pentacles is! Have to admit, I'm looking forward to the new edition of this, as I also have the Russian Edition. And despite having studied Russian as a teen, I find it a little distracting. I do have the Marrakech deck, which I got long before coming here and which, though North African influenced, is from France. i haven't seen any decks here, and don't really expect to, though if I ran into any of course I'd be pleasantly surprised and snap it up.